Spider mite damage to apple leaf. Most sites are approaching the end of second generation egg hatch. In general, keep the fruit protected up until September 15. White apple leafhopper feeding damage is concentrated around leaf veins. Where present, feeding damage from the second generation of leafhopper nymphs can now be seen on the foliage. Nymphs are active mainly on the undersides of leaves. If your trees had a high population of the first generation, now would be a good time to treat to prevent a nuisance of adults during harvest. Nymphs are easier to treat than the adults because they are less mobile. Adult activity will become very noticeable by late August. 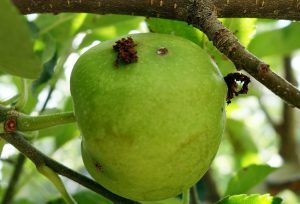 Note that feeding on the foliage will not affect apple yield or tree health. Options for commercial growers: click here. Woolly apple aphids have a thick cottony coating that can be impervious to insecticides. They feed on branches and twigs through the summer. 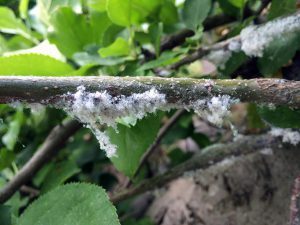 Woolly apple aphid colonies are increasing steadily, and are primarily found along twigs and on old pruning scars. This aphid also feeds on roots, causing galls to form, and reducing tree vigor and crop load. 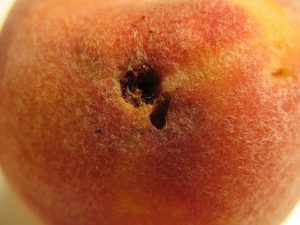 Heavy infestations can leave honeydew and cause sooty mold on fruit. They are also a nuisance during harvest. If woollies are a problem every year, it is best to treat them early. Otherwise, treat them when they increase to the point of covering more than 10-20% of the tree. Because of the aphid’s thick, waxy coating, it is important to spray the tree to drip to reach the aphid bodies. The hole in this fruit is from the peach twig borer larva, pushing out frass (excrement). Second generation egg hatch has begun in most areas. Like codling moth, keep the peach fruit protected up until Sept 15 (or until harvest). Continue to maintain protection of the lower trunk of peach/nectarine and apricot (where necessary) with your last treatment around September 15 (so that the trunk is protected through Oct 15). When you spray, be sure to move mulch or weeds away from the trunk (or even excess soil) because sometimes eggs are laid below grade. This fall, determine the success of your treatment program by inspecting your trees. Remove dirt from around the base of the tree down to about 4 inches. Look for oozing gum mixed with frass. If you find any symptoms, you will know that you need to improve your control program for next year. Backyard growers can use Hi Yield Permethrin, Sevin, Spectracide Trizicide, or for organic control, products containing spinosad. Late-season coryneum infections are sunken and soft. With the monsoonal rains to come, there is a risk of late-season infections occurring on the softening peach fruit. These infections look different from early-season infections. Sometimes, the damage will not show up until after harvest. Protection against late season infections on ripening fruit is particularly important where there is a history of this disease. During the three to four weeks before harvest, be diligent about monitoring your fruit, and apply a protection before a forecasted rainfall (ideally). At least 4 hours of rainfall and temperatures of 70 F to 80°F are optimal conditions for infections. 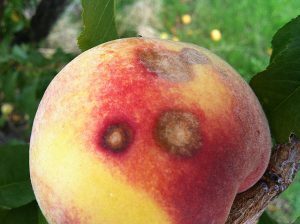 New infections are visible on maturing fruit in a matter of 2 to 5 days, and most often, render the fruit unsalable. 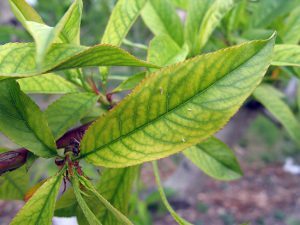 Additional infections can spread rapidly within an orchard or individual tree. Residential growers can use Spectracide Immunox or Captan. Commercial growers options: click here. Lack of iron causes chlorotic tissue and green veins. 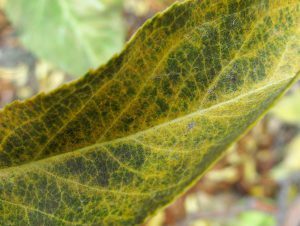 Iron chlorosis is common this season, as it is almost every year. Now is the time to collect foliar tissue for nutrient analysis to help develop a nutrient program for next spring. The USU Analytical Lab (435-797-2217) tests all foliar and soil samples for Utah. The iron issue is not caused by a lack of iron in the soil, but rather the soil pH (which ranges from 7.5 to 8.5). In Utah’s high pH soils, iron becomes insoluble, and therefore not available for root absorption. Because irrigation water is also very alkaline, trying to manage iron deficiency by reducing soil pH is impossible. Iron deficiency is exacerbated by soil wetness or an uneven root to shoot ratio. Iron is a nutrient necessary for the formation of chlorophyll. Iron-deficient leaves have interveinal chlorosis (yellowing between veins). Some trees are genetically more susceptible to nutrient deficiencies than others. To prevent or treat iron deficiency, chelated iron should be applied to the soil in spring before budbreak. Usually one application is good for the entire season, but must be repeated again the following spring. Adding iron to the soil later in the season may not provide results. Foliar sprays (0.1%) with a spreader-sticker provide quick results but must be reapplied at approximately 10- to 21-day intervals. 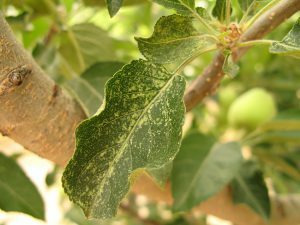 The drawback of foliar sprays is that staining of fruit can occur. The best form of chelated iron to use is EDDHA, sold as Sequestrene or Miller’s Ferriplus.